This being my last morning in Firenze ( for a bit) I wanted to get myself organized for tomorrow’s departure. 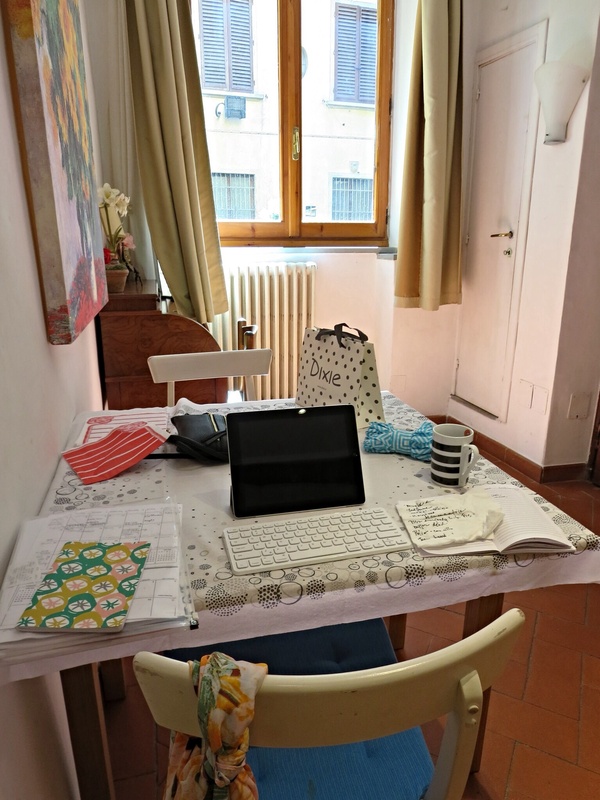 As you can see, my appartamento is beginning to look like home with things placed and stacked here and there. 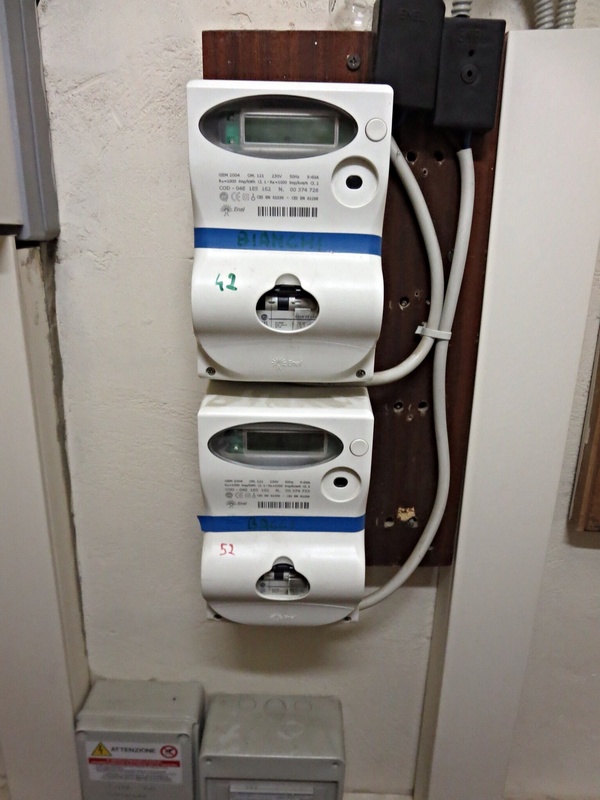 As I am writing a bit, ironing a bit, recharging a bit…the power goes off. Thank goodness Tomaso had warned…no that’s a strong word…Tomaso had mentioned this in passing and showed me what to do in case. I was to tak-a the smallest-a key-a, go-a outside-a in the hall-a, unlock-a thees leetle brown-a door-a and-a fleep-a the sweetch-a. So still in my pj’s and “morning about the apartamento” self…I attempt to do just-a that-a. 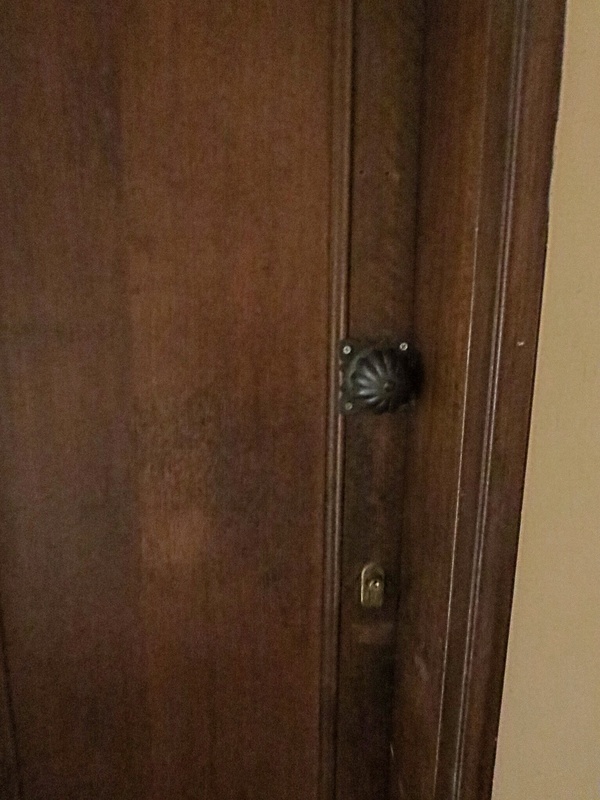 Leetle brown-a door-a…check. Flip-a the sweetch-a….Hhhmmmmm….Am I a “”Bianchi” or a “Bici”? I know he told-a me-a…..So, I stick my head back out the door-, look around and switch both of them…. I go back to my appartamento to check and nothing has happened. I try this again, scurrying back and forth each time, starting to geeeet-a beet-a worried now-a. The room is getting warmer (or is it just me), so I leave the door open and wait for passer bys. I am thinking at least the Biachi or Bici that I am not will come check to see what the heck is going on with their lights. There is a girl that goes by a couple of times, but understands no english. Same with the 2nd guy. At the point of the 3rd woman, I am sure I am looking pitiful. I will say this, I continued to tell myself this could be so much worse. It could be night, it could be tomorrow morning when I am trying to catch my train. Oh, and in the meantime, I tried to email, text and call Alessandro and Tomaso (but the wifi here is not strong enough to accept or send any emails). Anyway, this 3rd tenant, listens to my issue and walks off telling me she will call Alessandro. About 15 minutes later, she returns, walks in the appartamento, opens another leeetle closet and says, “Ah yes (as she is fleeping a different switch). Theees-a appens all the time-a. Een-a Italy, we-a are-a us-a to theeesa”. And with that, my day is back on track. After packing and cleaning up, I choose to wear my new vestito. 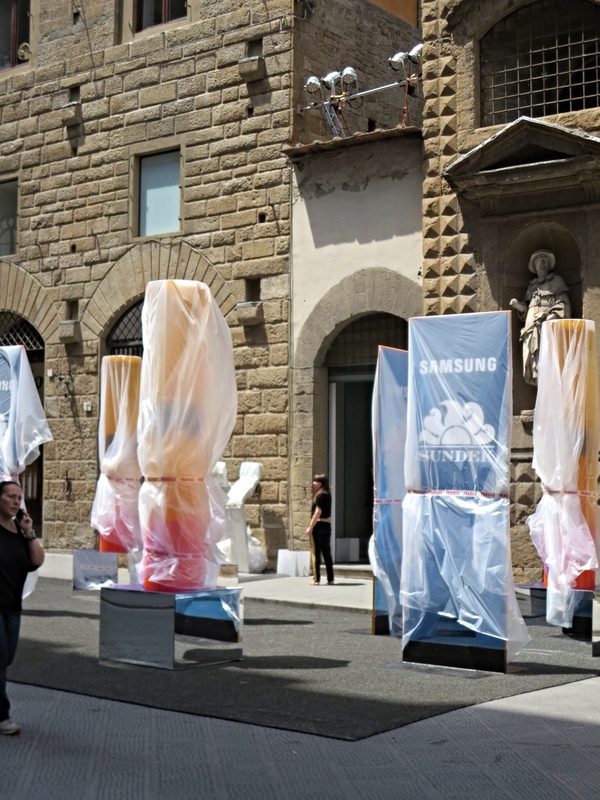 I think during Florence Fashion Week, I should wear something from here. Feeling confident, I once again enter the Ferragamo store to sample their perfume. It is another way I think I can support my neighbor, buying the perfume before I leave. After smelling several, I choose my favorite, the woman sprays me down, and I am off again. Well, I thought I was off. When I stepped out the main door of my building, the shopkeeper across the street was enjoying a melone. With the juices running down his face, I was assured the melone was perfect for eating. So, I buy one for tonight, run back up, set it on my tavola and NOW I’m off again. More progress for tonight’s party. 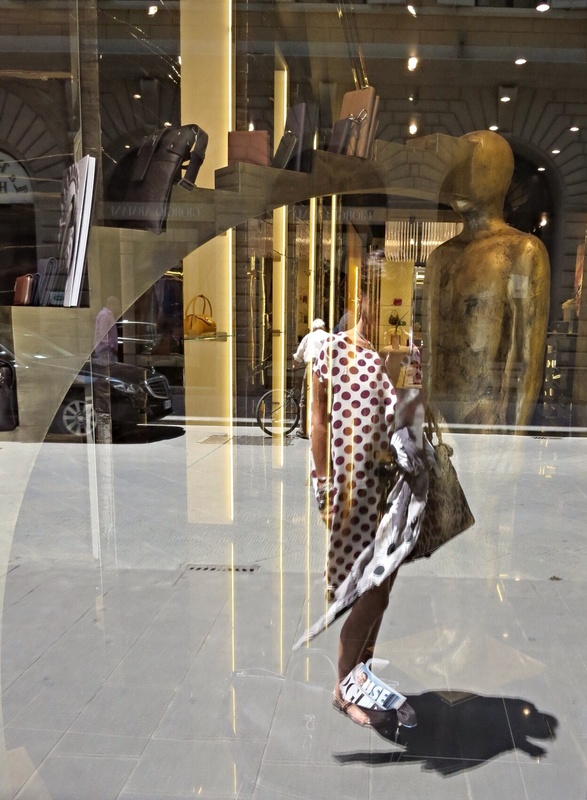 A shot of me in today’s fashion- Gucci window. 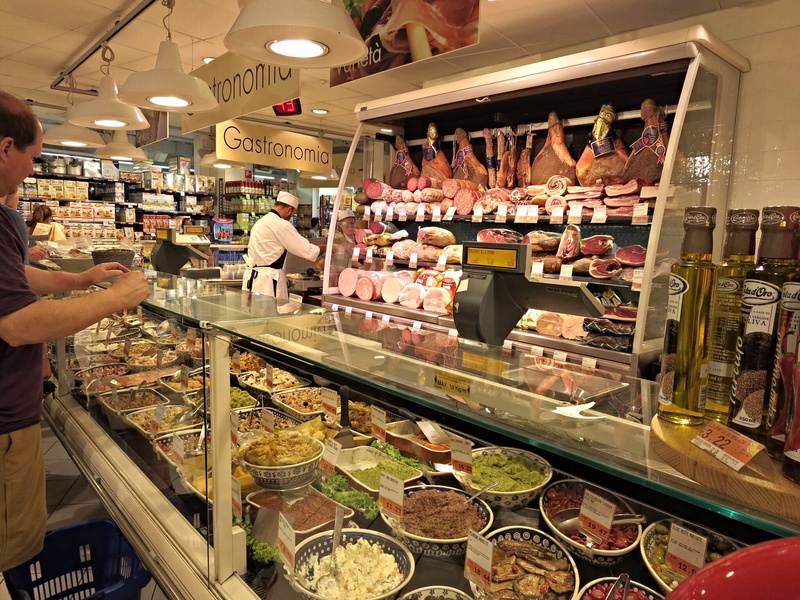 In Mercato Centrale, there is a little shop highlighting some of the products from Eataly. I think mom and dad had mentioned this and I know Jim and Tricia love the one in New York. I am pretty sure I overheard someone mentioned there is a larger Eataly near the Mercato, so I start poking around. 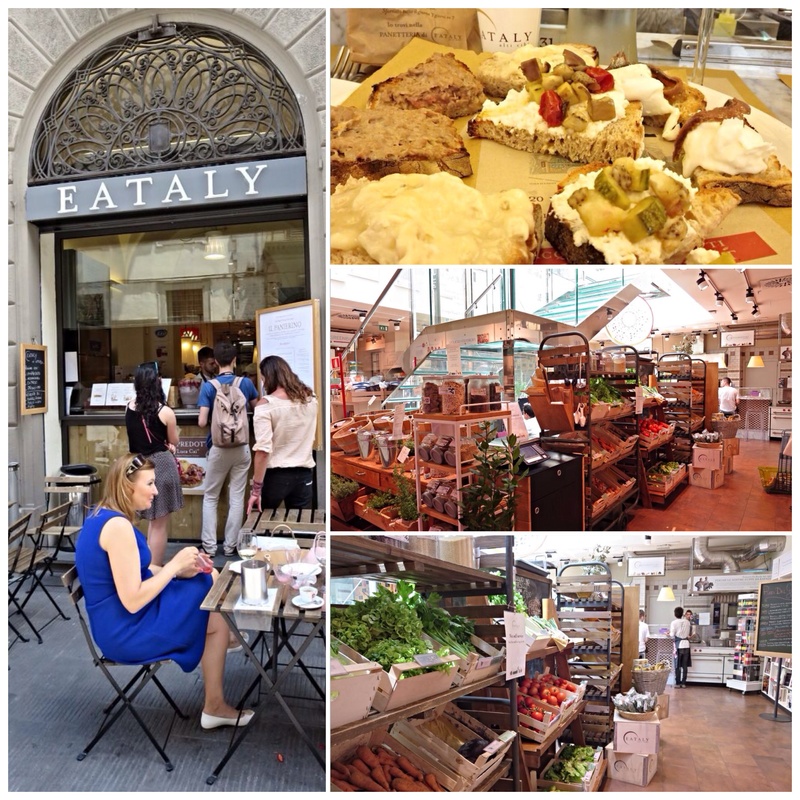 Sure enough, right off one of the side streets to the left of the Duomo…I find Eataly. Eataly is, they say, the largest Italian marketplace in the world, comprising a variety of restaurants, food, beverage counters, bakeries, retail items and a cooking school. What’s not to like right? So I enter. I walk around a bit and find the casual dining area, I am seated at the bar looking over the chef’s prep area. I choose the bruschetta sample plate, a glass of white local and aqua frizzante. My review would be that the food was good…it did not blow me away. I felt like I was eating at the cafe at Nordstrom. It is a good place to know about, no doubt. Especially if you have an appartamento here where you can cook. But I would rather roll the dice and eat from the streets. 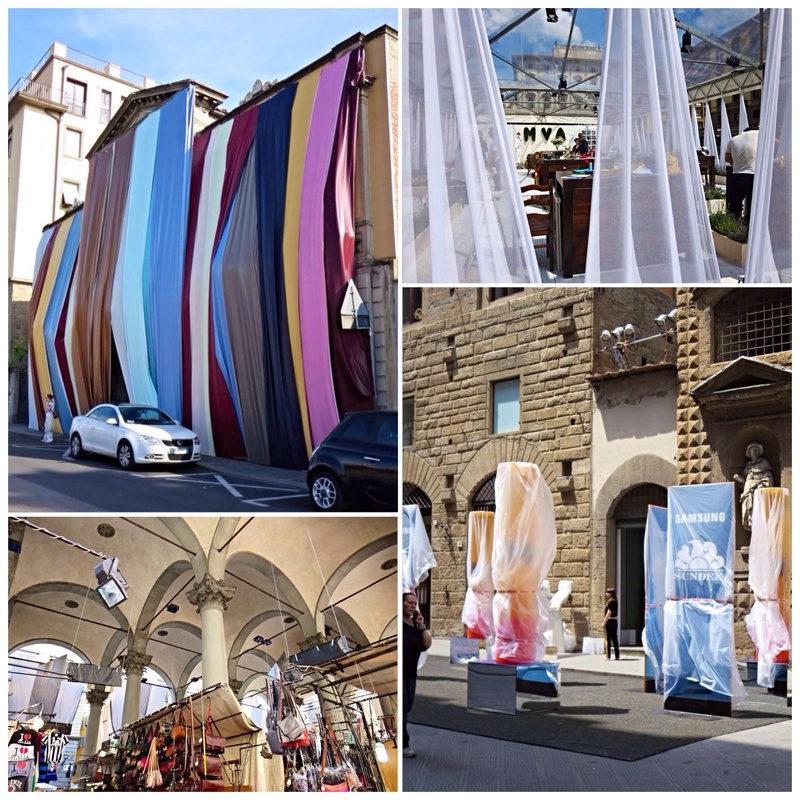 Speaking of le strade, they are full of areas being set up for those in the fashion know. 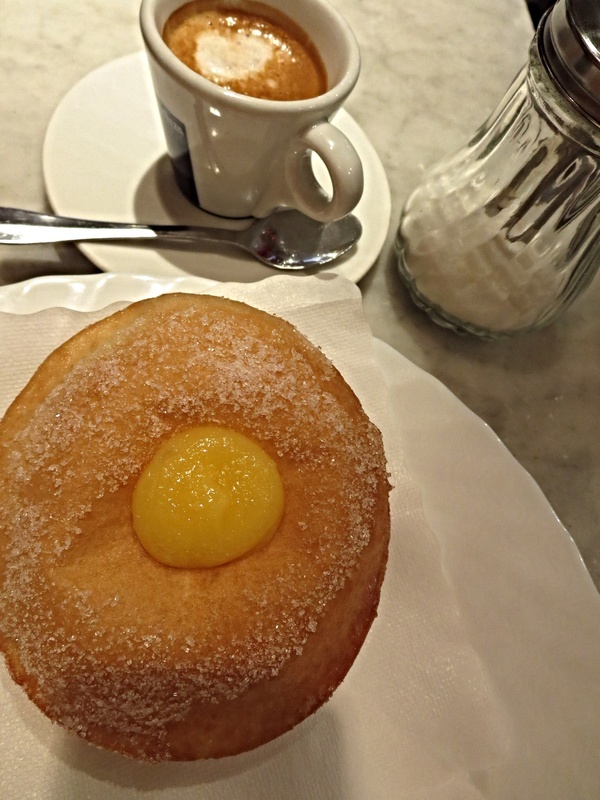 Time for dolce e cafe, no? Still looking good, even full of cibo. 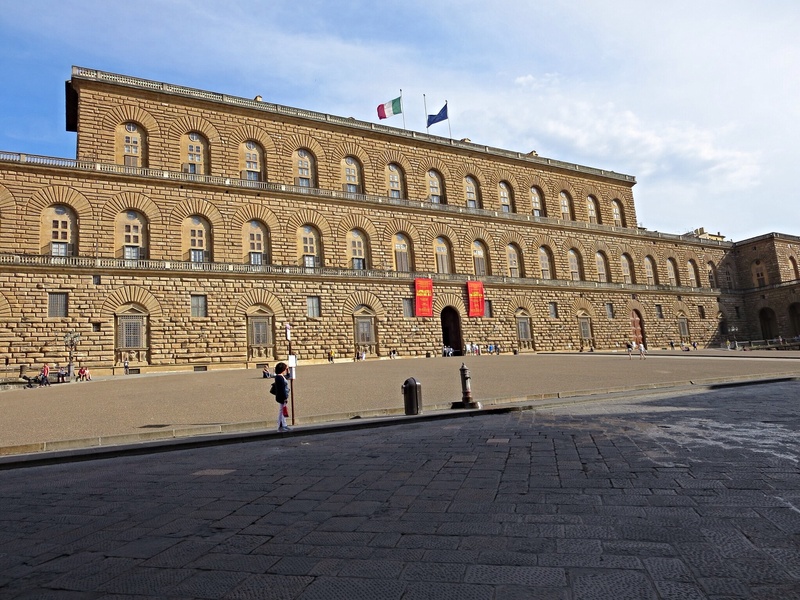 With all the preparation for parties, I think the Pitti, where I understand much of the festivities are being held, should be pretty spectacular. So I cross the Arno to find it looking like its stodgy self. What a Pitti. 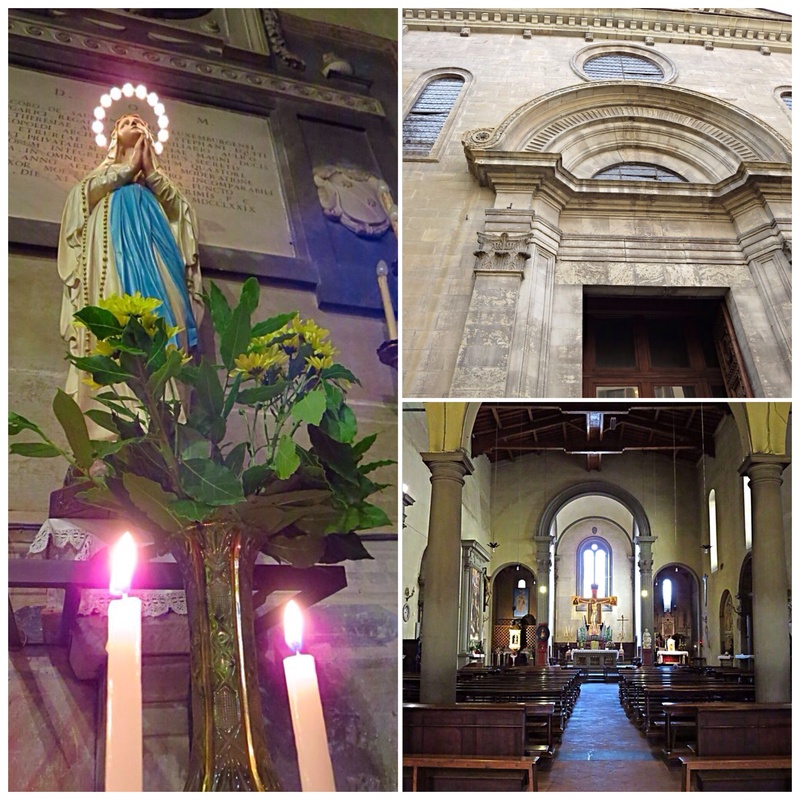 Although it is a lovely, breezy day out, ducking into a dark, cool chiesa is always special. This is the Chiesa di San Felice. The church with a single nave was built during the 11th Century. The Renaissance facade was added in 1457. Parts of 13th Century frescoes are still visible on the walls. The large, painted crucifix is attributed to Giotto or his school. Strolling through this area of Oltrarno, I jot down ideas to take home and places to return to in July during my last days in Italia. I loved this studio, where no space was safe from embellishment. 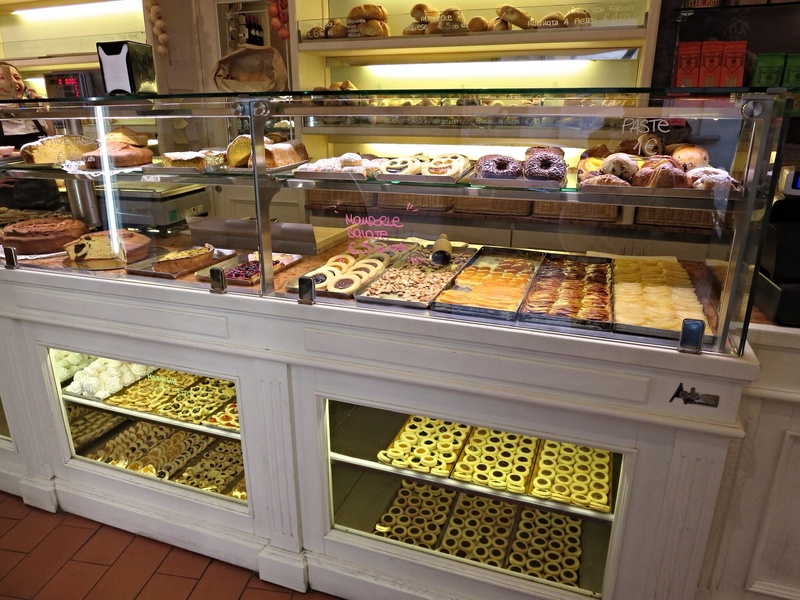 Knowing I will be hoping a train tomorrow and making the mistake once of grabbing a bite across from the stazione, I enter this pasticceria and buy some things for the rails. I chose some plain cake (the woman indicated it was plain by slapping her hands together like “all gone”, some thin, thin, oily, crispy bread with rosemary on top and a small bag of roasted mandorle salate. These were amazing! 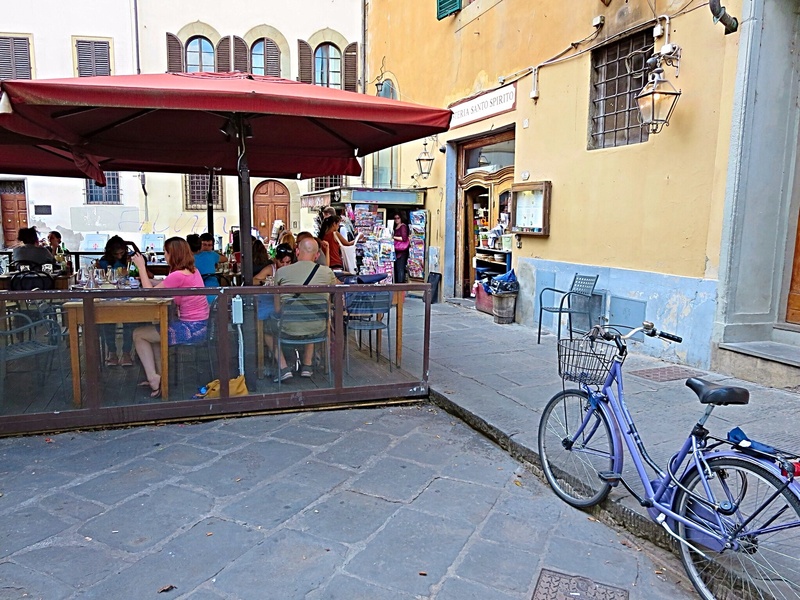 During my conversation with Australians Kate and Mark, Osteria Santo Spirito was one of the places that had been recommended to them. 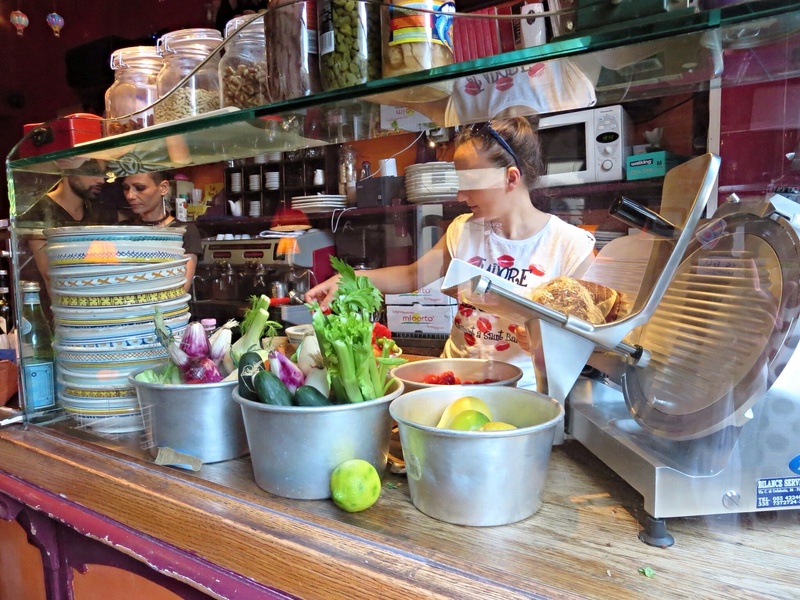 Peering into bowls as people ate and a peek into the kitchen sold me. I will return. 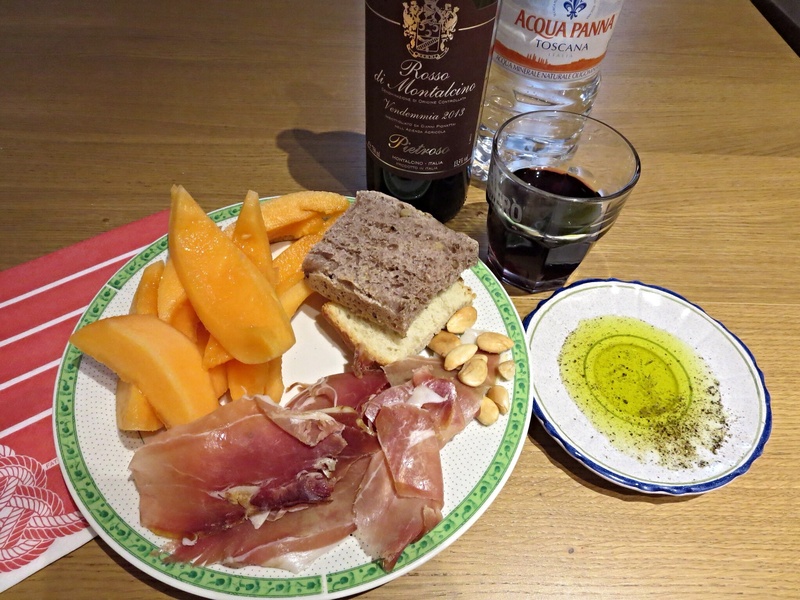 Ready to head back and enjoy my melone and left over wine, I look for a place to buy some prosciutto. Since Tamero Pasta Bar, where I ate last night, is across the piazza, I try there. I am told (after minutes of Italian conversation by the waiter, another waiter and the chef) that selling the prosciutto to me by the slice would be very expensice. 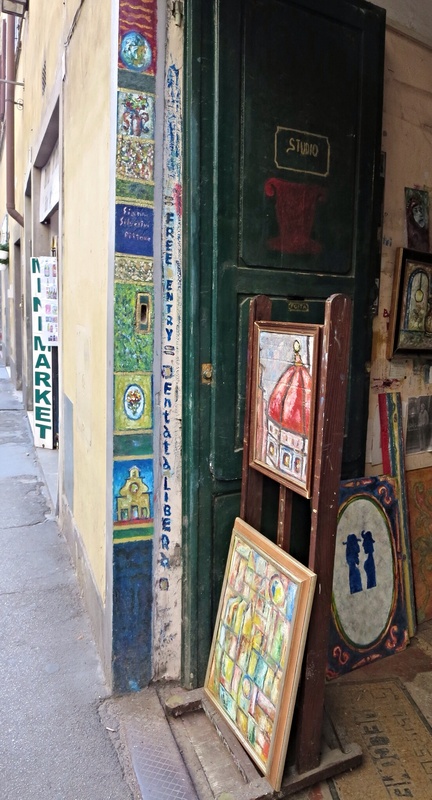 The chef instead advises me to go to a very nice market right by Ponte Vecchio instead. So I head that way. Near Ponte Vecchio, I see several bars and enotecas. They are bustling as it is aperitivo time. I go into a piccolo one where I see meats hanging. They sell me 8 slices of prosciutto for less than 2 eruo. When I walk 2 more steps I know see the market the chef was talking about. I enter to see what I missed. Yes, this must be the place. Again, very good to know about. BUT you must not enter too hungry. The lines to check our are crazy. So, my uninformed choice was a good one. Happily I enter my appartamento to the smell of my melone, Mom would die, but it makes me smile. I cut up the entire melone, toast the leftover pana from last night (baggies in your purse come in handy), open my prosciutto from its paper wrapping, take a few of tomorrow’s mandorle salate, pour some olive oil and wine and there…A fabulous dinner! Passing the street set up on my way into the appartamento, the party was just getting started. I decide to throw on a scarf and some sunglasses and walk through the crowd. I leave you with your special invite. 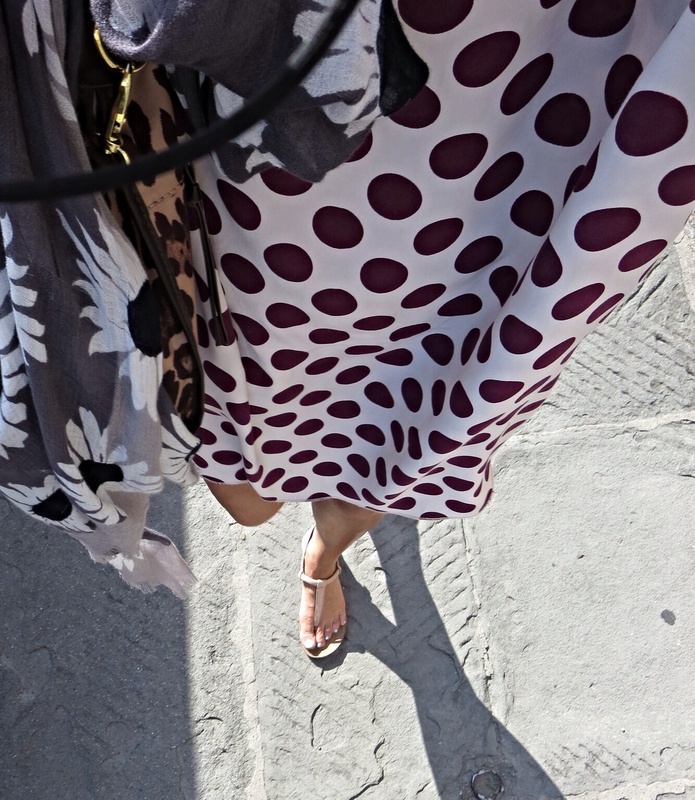 This entry was posted in Uncategorized and tagged Eataly, Fashion Week in Florence, Florence, Oltrarno, Pitti Immagine, Solo Travel in Italy by paigetc. Bookmark the permalink. When can we go with you?? I am ready!!! Safe travels. Ahhh. Thank a you a! Having read this, I am inspired to live this Saturday with a different mindset! Sorry, about Eataly. We love it in NYC, but more as an experience rather than the food. Love your dress! You fit right in at Fashion Week. Btw, that’s some stealthy videoing at the party. Good job!